With over 100 tools, WebTools Pro is a unique application for any web developer that finally allows you to construct an HTML page with ease. You can analyze any page's information, scripts, stylesheets, and structure while still working in your favorite editor. The WebTools Pro software manipulates the HTML that you view, providing reports and that hard to find information that will make you wonder why you ever 'Viewed Source'. The WebTools Pro software manipulates the HTML that you view, providing reports and that hard to find information that will make you wonder why you ever 'Viewed Source'. 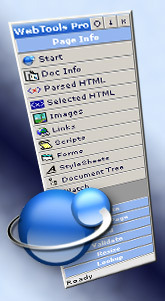 To use WebTools Pro first open Internet Explorer 5 (or greater, PC only) and navigate to a page that you're interested in. Then Open WebTools Pro and the compact menu bar will be displayed in the corner of your screen. Click the WebTools button you want for instant reports and information based on the page that you have open in Internet Explorer. Couldn't be simpler. There are many reports to choose from, including Forms, Images and Scripts. You can also use the tools on the "Change Page" menu to X-Ray the page and show the structure and composition of it's elements. Qweas is providing links to WebTools Pro 1.1 as a courtesy, and makes no representations regarding WebTools Pro or any other applications or any information related thereto. Any questions, complaints or claims regarding this application WebTools Pro 1.1 must be directed to the appropriate software vendor. You may click the publisher link of WebTools Pro on the top of this page to get more details about the vendor.